Parking permit window stickers using static cling technology for easy application and removal. Choose from a variety of colours and quantities. 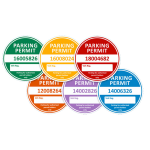 These stylish parking permits are printed to static cling for easy application and removal. Choose from a variety of colours and quantities.